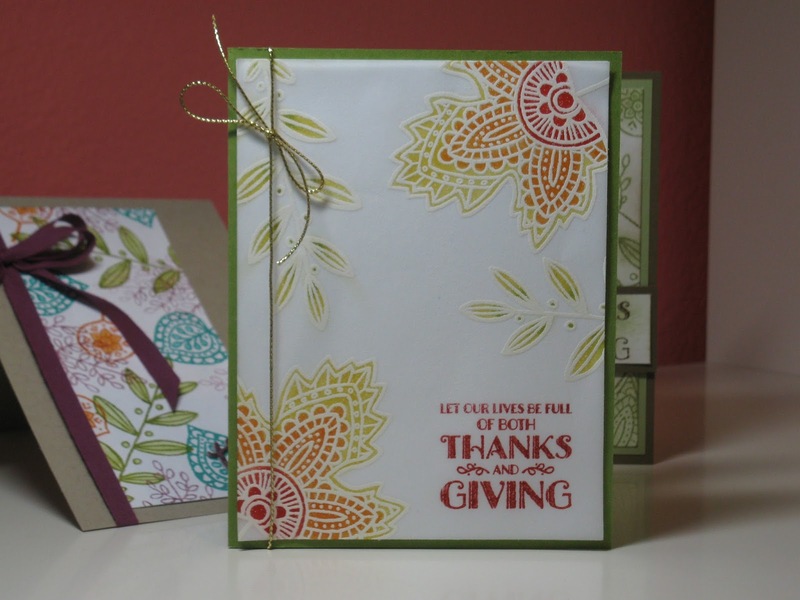 I promised you guys a picture to show the finished card I started with the new Lighthearted Leaves stamp set available from Stampin'Up! on September 1st. After lots of playing and trying different accents I just stepped back and decided I needed to keep it simple. The colored leaves on the vellum give it a simple elegance all on its own. It doesn't need a lot of googas. (Is that a word?) I added the new gold cord (that will be available on September 1st also) and decided that was enough. I used Real Red ink for the sentiment. I'm not sure about the color though. If I had to do it again I might choose a different color. I think a simple black or Old Olive might have been a better choice. Anyway, there it is. My third card using the new stamp set from Stampin'Up! coming your way, Lighthearted Leaves. I just can't get enough of this set, in case you couldn't tell. I have one last card using this set to share with you, but I made it for my club that doesn't meet until next month so I have to keep it a secret until then. I will post a picture of it after our club meeting. Hummmm, now the question is, what new stamp set am I gonna play with next?